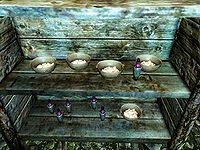 After completing the Helping Hand quest, you can ask Wujeeta where she obtained her skooma. She is not forthcoming with the details, however you can pass a speech check to get her to tell you the truth. Esta página foi modificada pela última vez à(s) 20h52min de 24 de junho de 2015.